On 16 February 2017, the Latin American and Caribbean (LAC) SUN Civil Society Alliances from Guatemala, Peru and El Salvador (with the Colombian civil society representative as observer) held a webinar on their 2016 achievements, and future perspectives. The objective of the webinar was to share their latest progress at national level. Participants included Milo Stanojevich, chair of the Peru Civil Society Alliance and chair of the SUN Civil Society Network; Blanca Rodríguez, coordinator of the Guatemala SUN Civil Society Alliance; John Edward Aguilar Cativo, coordinator of the El Salvador SUN Civil Society Alliance “Nutres”; Jorge Freyre, regional advocacy director of Save the Children Guatemala; Roberto Cabrera, CEO of Save the Children Guatemala; Stephanie Welter Llano, international relations analyst of Fundación Éxito Colombia, observer in the SUN Latin-American regional group and Cecilia Ruberto, coordinator of SUN Civil Society Learning Routes. 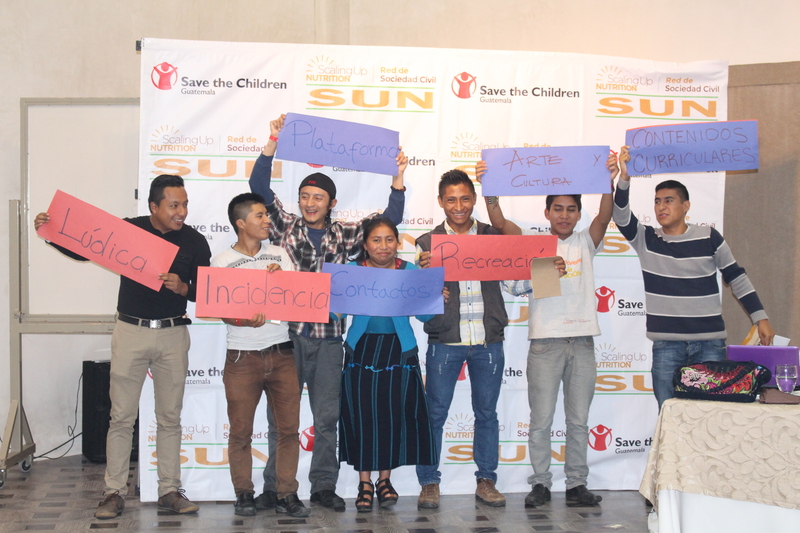 Since October 2015, the LAC SUN Civil Society Alliances have been meeting once every two months to update each other about past and upcoming activities. The aim of these webinars is to increase their visibility and foster opportunities to collaborate with other SUN regional alliances and stakeholders. This time, participants covered a wide range of issues, including the 1,000-day ‘window of opportunity’, community-based support for breastfeeding, advocacy actions for good nutrition and WASH practices among communities (key messages, media involvement, etc. ), engagement of parliamentarians, capacity building activities in food safety for food handlers in school canteens. The next webinars will be held on Thursday, April 20, 2017. Undernutrition and obesity – the group undertakes advocacy actions based on the Regional Obesity Reduction Plan signed by all Health Ministers of the region. Budget tracking – the group aims at systematizing countries experiences of resources tracking. Return on investment – the group analyses the impact of investments in nutrition, both at national and local levels. Accountability – the group is engaged in fostering the accountability of nutrition stakeholders and governments. Food security – the group aims at documenting the links between food security, nutrition security and child nutrition. Established in 2013, Guatemala SUN Civil Society Alliance consists of 250 national and international NGOs focused on the health, nutrition and empowerment of children, women and indigenous communities. It seeks to develop and implement a common monitoring and social audit agenda for the effective implementation of the 1,000-day ‘window of opportunity’ and the National Strategy to Prevent Chronic Malnutrition 2016-2020 (Estrategia Nacional para la Prevención de la Desnutrición Crónica 2016-2020 – ENPDC) at national and local level. Among its actions, mention may be made of a mass communication campaign, Juntos le ganamos a la desnutrición (‘Together we can beat undernutrition’), that informs and empowers women, adolescents and children about their health rights, the 1,000 days, breastfeeding and WASH practices. More than 300 young leaders, from the “Youth Network for Nutrition” have been trained. The key messages of this campaign are broadcasted on radio and TV programmes in 5 languages. Established in 2006, the Iniciativa contra la Desnutrición Infantil (‘Initiative against Child Malnutrition’) is a collective effort of 20 national and international organisations that focus on the reduction of chronic malnutrition in Peru. The alliance tracks and evaluates the nutrition actions taken by the government, supports the implementation of the nutrition plans, monitors progress and provides recommendations on an annual basis. Established in 2014, the Alianza de las Organizaciones de la Sociedad Civil por la Soberanía y Seguridad Alimentaria Nutricional – NUTRES (‘Alliance of Civil Society Organisations for Food Sovereignty and Security’) is made up of 7 national NGOS working on breastfeeding, WASH, indigenous communities and rural issues. The alliance advocates for considering nutrition as a national priority and the approval of a legal framework and policies Food Security and Sovereignty, but also for the 1,000 days and breastfeeding as a natural nutrition practice. Indeed, in September 22th, 2016, the alliance participated to the national multi-stakeholder consultation on a national nutrition commitment that will be presented at the Nutrition for Growth 2 summit (“El Salvador comprometido con la nutrición rumbo a la cumbre Nutrición para el Crecimiento”). In addition to advocacy and policy review activities, the alliance focuses its efforts on youth nutrition education and schools’ healthy dietary offers. Colombia is not a member of the SUN Movement and there is no consolidated civil society network. However, important efforts are being made by different national stakeholders to motivate and inspire scaling up nutrition actions for improved nutritional status of the Colombian population. Indeed, the Nu3 Foundation (member of the SUN Civil Society Network) and Fundación Éxito (foundation of Almacenes Éxito, the leading retail company in Colombia) are actively involved in mobilising others national civil society organisations for nutrition. Both organisations work with local institutions to enhance their strategies for early childhood care. They have developed nutrition guidelines for policy makers and, in 2016, they provided technical support to 25 municipalities in reviewing their national nutrition policies to clearly articulate their nutrition objectives and strategy. Since 2013, they have been raising awareness about the importance of breastfeeding through a national advocacy campaign called “Gen 0 that involves public and private sectors, NGOs, academia, media and communities.